PlacesSidebar is a widget that displays a list of frequently-used places in the file system: the user’s home directory, the user’s bookmarks, and volumes and drives. This widget is used as a sidebar in FileChooser and may be used by file managers and similar programs. The places sidebar displays drives and volumes, and will automatically mount or unmount them when the user selects them. Applications can hook to various signals in the places sidebar to customize its behavior. For example, they can add extra commands to the context menu of the sidebar. 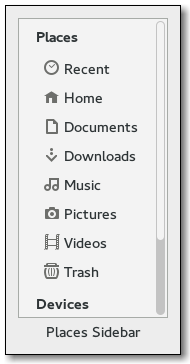 While bookmarks are completely in control of the user, the places sidebar also allows individual applications to provide extra shortcut folders that are unique to each application. For example, a Paint program may want to add a shortcut for a Clipart folder. You can do this with add_shortcut. To make use of the places sidebar, an application at least needs to connect to the open_location signal. This is emitted when the user selects in the sidebar a location to open. The application should also call set_location when it changes the currently-viewed location. GtkPlacesSidebar uses a single CSS node with name placessidebar and style class .sidebar. If populate_all is true, the populate_popup signal is also emitted for popovers. Creates a new PlacesSidebar widget. Applications may want to present some folders in the places sidebar if they could be immediately useful to users. Returns the value previously set with set_local_only. Gets the currently selected location in the this . This function queries the bookmarks added by the user to the places sidebar, and returns one of them. Gets the list of shortcuts. Removes an application-specific shortcut that has been previously been inserted with add_shortcut. Make the GtkPlacesSidebar show drop targets, so it can show the available drop targets and a "new bookmark" row. Sets whether the this should only show local files. Sets the location that is being shown in the widgets surrounding the this, for example, in a folder view in a file manager. Sets the way in which the calling application can open new locations from the places sidebar. Sets whether the this should show an item for connecting to a network server; this is off by default. Sets whether the this should show an item for the Desktop folder. Sets whether the this should show an item for entering a location; this is off by default. Sets whether the this should show an item for the application to show an Other Locations view; this is off by default. Sets whether the this should show an item for recent files. If you enable this, you should connect to the GtkPlacesSidebar::show-starred-location signal. Sets whether the this should show an item for the Trash location. The places sidebar emits this signal when it needs to ask the application to pop up a menu to ask the user for which drag action to perform. When the user starts a drag-and-drop operation and the sidebar needs to ask the application for which drag action to perform, then the sidebar will emit this signal. The places sidebar emits this signal when the user completes a drag-and-drop operation and one of the sidebar's items is the destination. The places sidebar emits this signal when it starts a new operation because the user clicked on some location that needs mounting. The places sidebar emits this signal when the user selects a location in it. The places sidebar emits this signal when the user invokes a contextual popup on one of its items. The places sidebar emits this signal when it needs the calling application to present an error message. The places sidebar emits this signal when it needs the calling application to present a way to show other locations e.
The places sidebar emits this signal when it starts a new operation because the user for example ejected some drive or unmounted a mount.